Iberis sempervirens is low-growing perennial and an early season favorite. 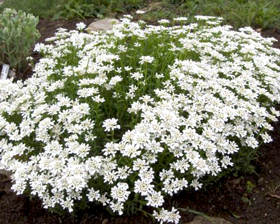 This low, bushy plant produces mounds of blinding white flowers that last throughout the spring and into early summer. Forming dense evergreen mats this easy to grow plant is useful in many planting schemes. Growing to only 15cm tall with a spread of 30cm they produce a mass of tightly packed flowers on short stems, the blooms are around 5cm wide. When not in flower, the mats make a good background for other flowers that enjoy similar growing conditions, especially rock plants. The foliage remains evergreen throughout the year, providing structure to a rock garden in winter. Sow in February to June or in September to October.